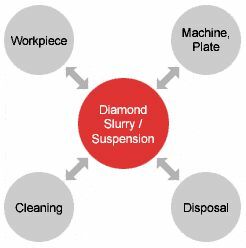 In today’s sensitive processes, an increasing number of users prefer ready-to-use diamond suspensions from Diprotex to their self-made slurry. While the traditional way of mixing diamond powder into some carrier liquid or paste provides acceptable results in many applications, the full potential of diamond abrasives is exploited only in carefully engineered slurries and suspensions. Diprotex slurries and suspensions are tailored to the specific requirements of each application, aiming for maximum effectiveness and reproducible results. The bottom line is reduced process cost and constant, high quality. We offer a wide range of watersoluble or oil-based carriers tailored to your specific application. Viscosities range from very low viscosity fluids to pastes. Any size and type of diamond can be used as abrasive, including GAF (guaranteed agglomerate-free) diamond products. Put our long-standing expertise in slurrymaking to the test. Contact us for the configuration of a diamond suspension for your specific application and requirements.